Hi everyone! I hope you are all having a great Sunday! I have a card today that I made this weekend and wanted to share! Yes it is hanging on a potato masher! It a recipe holder actually but I thought I would change it up a bit here! I have used this before on my blog but not for quite awhile! So, let me tell you about my card! This flower is made from white core paper and the Beautiful Blooms dies! I cut one of each size and sanded the edges! I stuck them together with glue dots and added a clear sticker with Lemon Tart cardstock for the center! Those adorable leaves are a die I found for the Quickutz Squeeze! I am going through and purging stuff as I move into my new craft room, so you can imagine how excited I was to find this! (Yes...I do have lots of stuff I haven never used...and obviously had no idea that I even had!) I used a new PTI IP for the background and matted it in some Ripe Avocado to match the leaves! The sentiment is from Market Street Stamps! So this is it for today! Hope all is well out in blog land! I am SO behind on my blogs! I am hoping to sit down tomorrow and see what everyone has been up to! Have a great day! Oh...this is absolutely stunning! Love, love, love the flower! I love that flower!!! It looks amazing and the sanded edges are the perfect touch. Beautiful card, Laurie! BEAUTIFUL bloom! Think I can smell it from here! This is such a fabulous card Laurie! I love the colors and that flower! Love the sanding on the flowers and the big pop of the yellow brad....fabulous! That flower looks like it's on canvas. It's beautiful and now I'm going to have to hoard some white core pape. White core paper is now on my list wish list! Beautiful card, Laurie! Absolutely gorgeous, girl! LOVIN' all that scrumptious texture! And your color combo is divine! Looking at this card is like drinking a huge cold glass of strawberry lemonade ......... LOVE IT!!! What a pretty card....potato masher and all!!! A bloomin' gorgeous card, girlie! I love the white edged to your flower! That is gorgeous! I'll have to try that sanding trick...looks great. Beautiful card Laurie! Love the sanded flower...you've inspired me! What a clever way to display your card, too! Beautiful Laurie! I love the yellow polka dots! So gorgeous! I've never seen anyone use Core paper that way. You're a genius! This is really pretty! The sanded flowers are so soft and I love the ripe avocado mat behind the pink! incredible!!! you are really rocking gurl!!! Laurie, this is gorgeous! I LOVE the colour combo and that flower is stunning. Such a pretty card! Love every fine detail of it! Love your IP background! 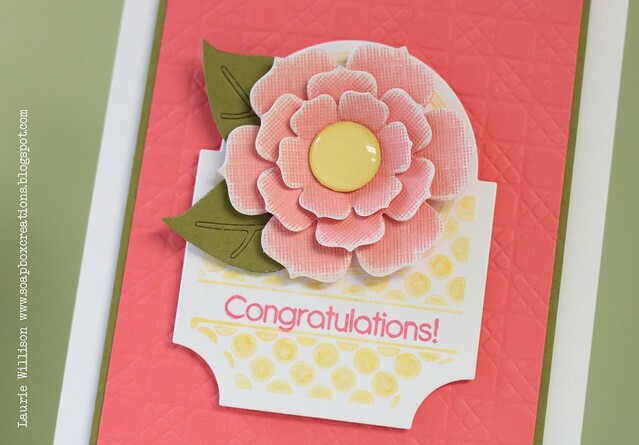 That flower looks gorgeous layered on that mat stack! Love it - those sanded edges really make the whole thing! Wonderful! 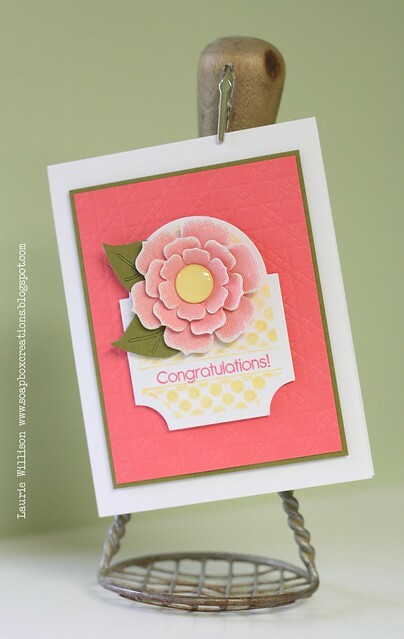 Love the use of the white core paper...it makes the layers of the flower just pop! Gorgeous card!